A lovely little 'side' triangle - swirls with little wings! This pattern works very well in the triangles each side of the main triangle in Flying Geese blocks. two patterns are given so that both the top and bottom triangles can be completed with out having to do any flipping. They are designed so that both can be registered from the base of the Flying Geese block to the top. if the quilt is one the machine so that all the Flying Geese fly from side to side - then these triangles are quickly registered - and many can be sewn with only one start and stop. - see the additional images for some ideas. Alvina continuous digital point to point (p2p) pattern. 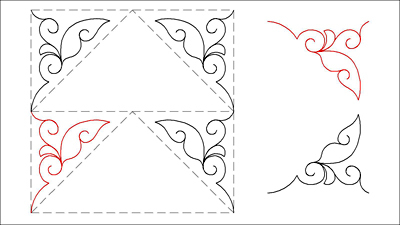 This design is suitable for use on a Statler Stitcher (on a Gammill), Intelliquilter, or Compuquilter longarm quilting machine. It is a side triangle.